What makes fashion accessory design exquisite in the world of Haute Couture? Couture fashion accessory design and Couture clothing go hand-in-hand. Why would anyone invest in an extravagant couture dress only to debut the dress with average-looking ready-made accessories? It just makes no sense. In fact, for the masses that cannot afford to have a couture gown made for them several times a year, you would be amazed to see the couture magic you can create with the right timeless custom couture accessories! This is where it gets fun and attainable! A couture gown you can wear maybe a few times, but the right accessories that bring out your best personality and concept can last a lifetime when styled in different ways. See the photo of a Couture handbag I designed. Note how they were just made for each other, and the uniqueness of the luxury hand-made Couture handbag adorned in crystals and real pearls. It is in true harmony with the symphony that resounds with couture extravagance! Our personal style in dressing reveals much about our personality! What does your style reveal? In fact, in recent years, the role of accessory couture has become more and more important. Never before have we seen so many designers putting an emphasis on handbags, shoes, jewelry, wraps, and millinery. Some major designer labels that started out “Haute Couture”, but have shifted to a more business-minded high-profit approach to ready-made designs, like Juicy Couture, have put huge focus on accessories. Even one of the most famous Couture houses in France, Dior, has rolled out collections of pure accessories that have taken center stage in their marketing efforts. Why have we seen this trend? Couture Accessories can be made and sold in a price-range that is reachable for the fashionistas that are not in the 3% who can buy Haute Couture Clothing. With a key Couture fashion accessory design, or better yet, many of them, you can take well-fitting, typical ready-made clothing to the realm of couture luxury. Accessories are practical! The usability is high. There is a limited number of places and times that you can get away with wearing a couture model dress. You can wear different combos of your couture accessories everyday if you wanted to. Even ready-made fashion accessory designs, if coupled with the right ready-made clothing, can give the allure of Couture to the uneducated if it is a high-fashion accessory and very unique. For example, look at the same j-na couture handbag displayed for the Dior gown above. Now look at Taylor Swift in this ready-made trendy, yet classic Disnology dress. Worn together, the ready-made takes on the allure of couture because the Couture handbag is the center of attention. Click here to see more fashion accessory design j-na original exlcusives in the gallery! That is what you can do with Couture fashion accessory design! A look and color that accentuates your best features and your personality. No two accessories should be made the same, each piece should be the only-one-of-its-kind original, and exclusive to the client. A mix of design mediums for extra appeal. They should be beaded fashion accessories. They should scream "ART"!!! 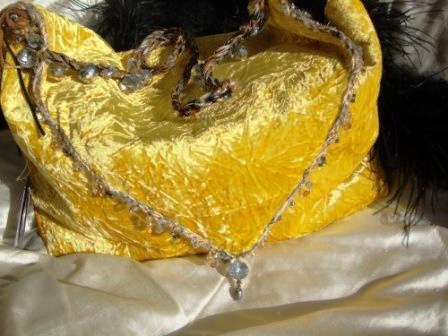 (As a purely personal preference, I like my accessories to be made of a riot of contrasting luxury fibers, fabrics and innovative materials like gems, crystal, gold, pewter and even feathers, in hand-sewn or knitted fashion accessories, except in the case of my jewelry line). I am Passionate about Couture Accessories because they are without a doubt the easiest, most versatile, and FUN way for you to reach your perfect Couture concept. An image that is custom-made and fitted to you. Your uniqueness as a precious and valued individual that has her own identity is what we will put at the top of our list! Go back to the Couture designers Page! Go Back to the homepage!